Wheelersburg senior Tanner Wilson signed his letter of intent with West Virgnia State University Wednesday everning at his signing ceremony at Wheelersburg High School. WHEELERSBURG – Tanner Wilson’s impact on the football field is immense. 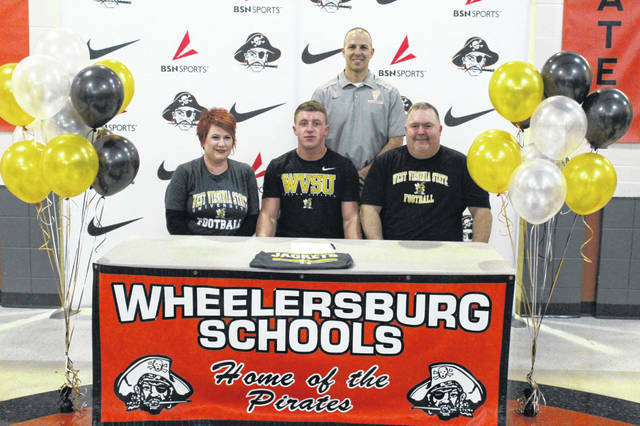 So much so that on Wednesday evening, Wilson signed his letter of intent to enroll and play football at West Virginia State University at his signing ceremony at Wheelersburg High School. Wilson played his senior season for the state semifinalist Pirates team after playing his first three seasons for Ironton, and his numbers for the staunch Pirates defense were more than impressive. During Wheelersburg’s fourteen game season which includes their four postseason games, Wilson broke the 100 tackle mark with 104 combined tackles on the season, 71 of which were unassisted and 33 of which were assisted, including two quarterback sacks and a forced fumble. The ability to play right away was one of the main factors that pushed Wilson towards joining Colin Boehm of Portsmouth as the two Scioto County players to sign with West Virginia State. Wilson said that his one year at Wheelersburg helped acclimate him for what an unfamiliar college setting could present upon graduation this spring. Wilson said that he plans on majoring in nursing upon enrolling at West Virginia State this fall. Three weeks ago, Wilson was selected to be one of three student athletes from the SOC to compete in the North-South Ohio All-Star game in Massillon later this spring. Without those friends and family who were present at the signing ceremony to support Wilson, he says he wouldn’t have been able to make it to where he is today.